There are two things that help me survive summer - swimming is one. My family claim I’m a horrible swimmer which is arguable at best but not entirely untrue. Lucky for me, the second thing is food, and I am better in that area than i am in the pool. It’s the season to stock up on everything thats refreshing to the body, light on the taste buds and basically makes up for this scorching month. I’m talking berries, mango, coconut, cold milk - the works. Dessert and wellness aren’t exactly synonymous. But with a little bit of flavour testing and ingredient substitution, I think we may have found something that is healthy and tastes like pudding. And can be eaten for breakfast. Or Lunch. Or dinner. Seriously. 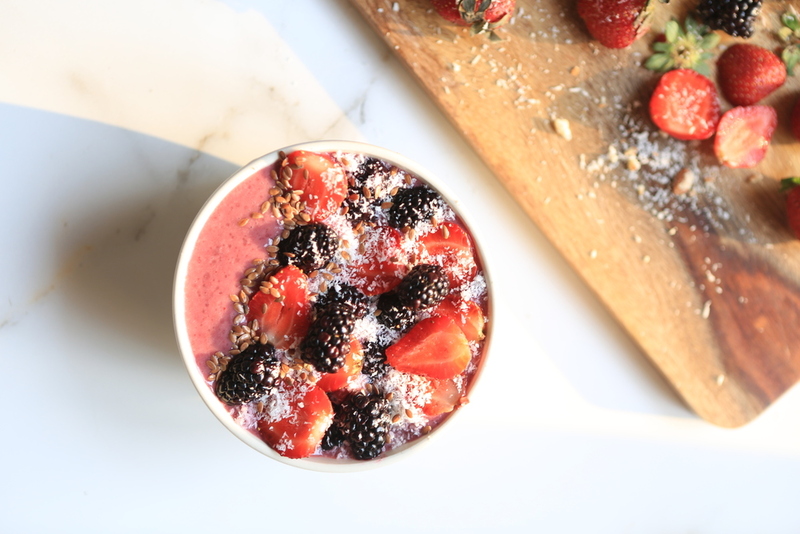 Jia had to educate me quite a bit about healthy ingredients, recipes and such but after a little work, these reeeally delicious and completely healthy smoothie bowls were born! Besides their incredible level of instagrammability (haha) They are actually super healthy - they’re made from an almond milk and banana base, contain zero sugar and taste like dessert. Almond milk is a dairy-free vegan alternative with no hormones or antibiotics of chemicals. Plus, one cup of almond milk contains only 40 - 50 calories per cup. Also, these smoothie bowls are packed with seeds and nuts, Omega 3, calcium, fibre, Iron and protein. Blend all the ingredients in a blender. Pour into a bowl and add toppings of your choice. We recommend fresh blackberries, strawberries, shredded coconut and shredded almond. Whenever you use an avocado, make sure it’s really really ripe (black in colour). Don’t use green avocados - it’ll make it taste bitter! Super green powder should be available at any high end nutrition store. This should be filling enough to last you a good 3 -4 hours.